Threaded Ball Stud Speed Clip - Bolt Products Inc.
Ball-Stud Clips were originally developed as spring catch fasteners on aircraft access doors, inspection panels, sealing strips and other similar assemblies requiring repeated disengagement. The versatility of these ball stud spring catch fasteners soon found them used extensively in other fields where they secured kitchen cabinet doors, removable toe plates, electronic cabinets, protective covers, etc. There is no direct contact between the stud and panel surfaces. This eliminates wear or chipping of painted or porcelained surfaces and resulting corrosion. When latched, the spring legs of the Ball Stud Clip continually bear inward on the spherical or serrated studs, holding the latched unit snug against the panel. 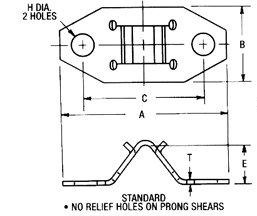 Where adjustability or wide latching ranges are required, the serrated stud is used with the spring catch fastener. They are mainly used for attaching compressionable materials such as rubber, fabric, insulation, etc. Pull-out tensions, depending on the material thickness of the Ball Stud Clip and the stud used, can be provided from 3.5 pounds to 50-65 pounds. Various panel thicknesses are accommodated by varying the stud lengths.